Judging from the people at PyCon UK that I spoke to, there was quite a lot of interest in learning Python. This is all good and to be expected. 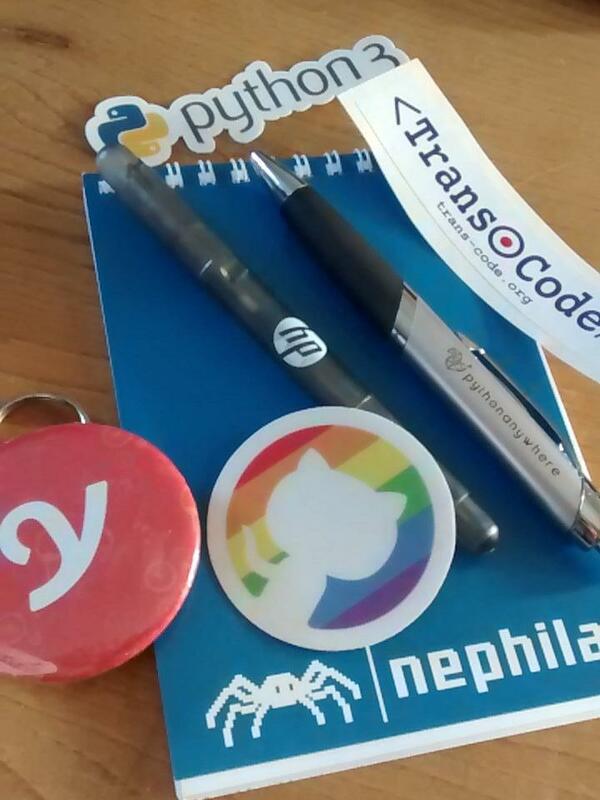 Not only are conferences a good place for the Python-curious, this conference had the Trans*Code, DjangoGirls, and the education track, all aimed at people who had never programmed in Python before. Several times I got asked, “So, how did you learn Python”. How I learnt Python was that I learnt Sinclair BASIC from Steve Vickers’ ZX81 BASIC Programming when I was about 10 years old. A combination of a wobbly RAM pack and unreliable tape means you get good at typing programs in. 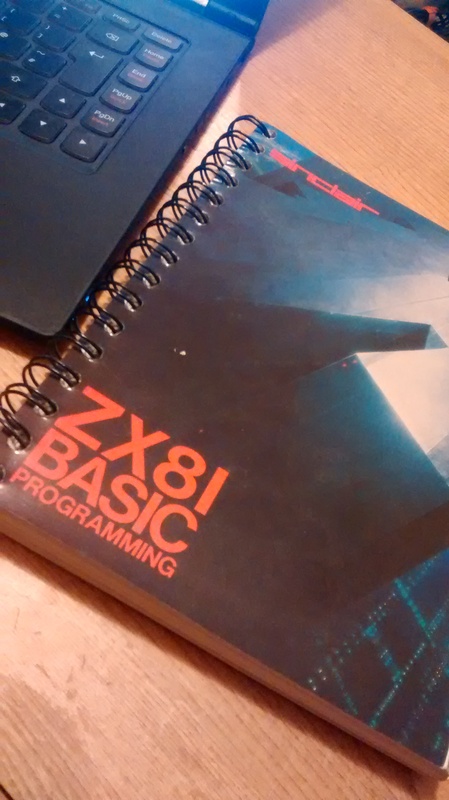 Then I learnt a bit of Zilog Z80 machine code and wrote my own assemblers, and dabbled in FORTH. At sixth form I got an Atari ST, and I learnt Motorola 68000 assembler and started to dabble in C, Lisp (XLISP), more FORTH, and extensible text editors (MicroEMACS). At university I found C, more Lisps (Cambridge, Acorn, Common), more extensible text editors (the wonderfully charming and parochial ZED and E), scripting languages (WREN, lol), and a bit of ML. Towards the end of university I started to learn about Unix and ed, sed, vi, emacs, and awk. After that I got a job as a C programmer and learnt a lot more C and bit about the SPARC, UltraSPARC, MIPS, and ALPHA architectures. As well as more Unixes, and a bit about Windows NT, and Dylan. Java appeared on the scene (and I did write one small program in it). After that I learnt Lua. And then, eventually, Python. As you might imagine, at this point, learning Python is rather easy. There is almost nothing new in the language except for the indentation. So my answer to the question is not very useful. Most people who ask the question want to know “how should they learn Python?”, and how I learnt Python is clearly not how they should learn Python. I’m not really sure I have a good answer, even though I’ve been involved in teaching it (at Software Carpentry, and with John Pinner at a PyCon). Python has an official tutorial, and I used that a long time ago and thought it was not bad. I’ve heard some fairly lukewarm responses from other beginners though. Software Carpentry is good, but not very frequent unless you want to travel a long way (and it is somewhat targeted at the scientific post-doc). I’ve never tried any of the MOOCs. I’ve seen someone go through many Python koans, but it didn’t seem to help them learn Python any faster than any other way. DjangoGirls had a very positive response at PyCon UK, and not only teaches Python from scratch but also Django, so you can make a useful website. So if you like cycling write an app to calculate your favourite gear ratios, if you like climate science, try recreating the global historical temperature change. If you haven’t learnt Python yet, how are you planning to? If you’re learning Python, how are you doing it? If you know Python, how did you learn it? I met the Irish, the Greeks. I met the Django Girls, the Trans*Coders, the Posters. I met the teachers, the testers, the gamers. I met old friends, I tended acquaintances hoping to grow them into friendships, and I made new friends. I don’t know if you’ve noticed, but we have a diversity problem. By “we” I mean the programming community. One could spend an entire career and meet only white middle class straight cis men. If you have the opportunity, try and avoid that. To quote Rachel Evans summarising the PyCon UK attendance: 300 delegates on the main track, 55 Django Girls and TransCode, 30 scientists, 40 teachers, and 100 children; 20% women. I’m glad someone is watching (and I would encourage the newly formed PyCon UK Committee to appoint a diversity officer, to watch on a formal basis). And I’m pretty sure that Rachel is right, this is better than many parts of the tech sector. My own experience is that professional interactions are > 95% with other men. And of course gender is just one small aspect of diversity, and male/female is just one aspect of gender. So, the non-white, the trans, the gay, all under-represented. That is why I agree with Rachel that there is still room for improvement, and that Belinda Parmar is right to point out that it’s another dude fest. I was in that hall and it certainly had more “dudes” than the morning before when the ranks of dudes were swelled by our allies Trans*Code, Django Girls, and teachers. On a positive note, the dudes have turned up to see one the the Django Girl organisers, @helenst, present her experiences on Managing Mocks. Daniele Procida’s keynote was about how in the Open Source world power is left lying around for the taking. Whom you pay attention to is a small example of that power. Stop going to talks by white middle class straight cis men, stop reading my blog, and start paying attention to the diversity that your community already has. Foster it. Fund it. And don’t worry, the poor downtrodden white cis man will still have plenty of opportunity to give talks and plenty of people listening to them. I think PyCon UK is doing great. I went to see the science track, the education track, Trans*code, DjangoGirls. And once I’d done that, the so called “main” conference didn’t seem so main any more. I’m always so grateful for the speakers. For without speakers there would be no conference, and without the conference there would be no people. I remember a few years ago at a EuroPython in Birmingham, in the morning I met someone for whom it was their first conference. Towards the end of the first day I spotted them again and they looked very tired, I asked them how many talks this person had been to and they replied “all of them”. “Beginner mistake!” I replied, and explained that if you went to all the talks that you could then you would be very tired, your brain would fill up and overflow, and in any case “the corridor track” was where it was at. This year I think I tried for about 50:50 talks and “corridor track”. If you’re not familiar with the term “corridor track” it means all the talking and conferring that goes on in the corridor, outside the scheduled talks. If you think about it, it’s really the only place you can properly confer with someone, which is the whole point of a conference. But this blog article is about the talks. I went to the @ntoll and @teknoteacher show who were cajoling and encouraging the teachers in the education track, being generally enthusiastic about all things Python and all things education, and introducing developers to teachers. In a similar vein I went to (stumbled into would perhaps be more accurate) MissPhilbin‘s “colouring in” class. It was actually a practical hands on workshop using the Pi Foundation’s new Sense Hat. I was impressed at the mix of skills needed (bit of design and colouring in of pixel art, bit of colour theory, bit of programming, and interaction design). More of that please. Daniele Procida’s keynote “All I Want Is Power” was very smoothly delivered and mixed light moments with really serious commentary. In an open source world the power is knowledge and doing (the “do”-ocracy, remember? ), and it’s lying around for the taking. So we should take it and begin the revolution. Something like that anyway. I finished the day with the Safe and Fiona show. Talking about their experiences of making cross platform (meaning mobile platform these days) games and finding and building the tools and frameworks to make them. The quest ends with using Kivy and building Myrmidon. It was a talk in two parts, Safe delivering part one and Fiona delivering part two, and I thought that worked quite well. Another early start on Saturday (I was driving from Sheffield), where after breakfast I watched Simon Sheridan’s talk, “Landing on a comet”. I was a little late, so if Simon started by explaining what his Ptolemy experiment had to do with Python, then I missed it. In any case, no matter about the Python connection, the talk was really interesting. Science, comets, serendipitous mishaps, all good fun. Because I was slightly late, I watched this from the overflow room, which I thought worked rather well. The audio and video feeds from the main room were brought into a side room where you could watch on the projector. I liked it. Zeth is one of those people who seems to have only a single name. Just Zeth. His talk on JSON and what to do when you want to add a bit of structure to JSON was somewhat misleadingly title “JSON and the daughters of Pelias”. I didn’t get the reference to the ancient greek Jason, husband of Medea, until Zeth had practically spelled it out for me. Adding type systems to JSON is always good fun. I wandered out to get a cup of tea, then realised I was too late to rejoin to see @helenst‘s talk on using Python mocks. Due to an all too common problem getting the laptop to talk to the main projector, the talk was late starting, so I did in fact manage to sneak in. Despite having to accelerate the talk to make it 10 minutes shorter, Helen’s talk was well delivered and very practical. I’ve used mocks a bit in the past and experience many of the same situations and experiences that Helen had, so I found a lot to sympathise with. Just before lunch Gemma Hentsch revealed why she has an unhealthy love of tests. I think all programmers are a little bit obsessive about something, so it’s nice to see this come out in a talk. 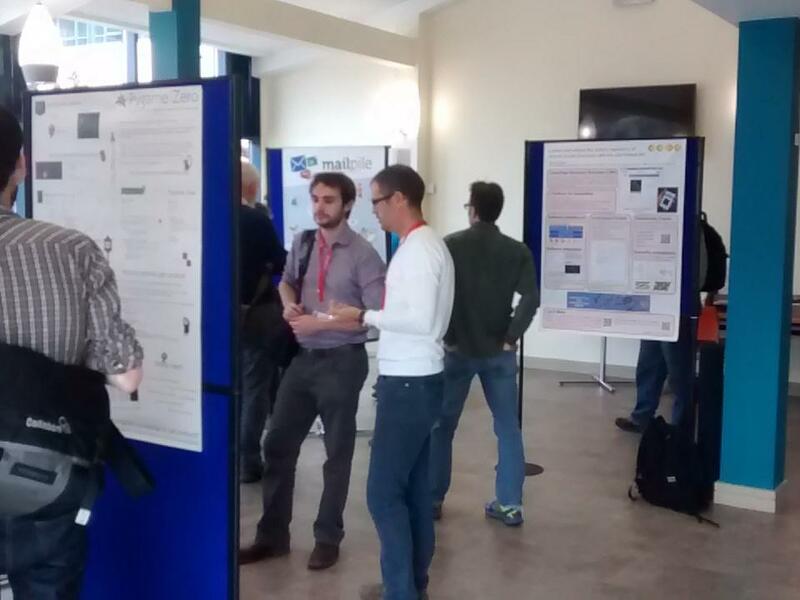 Thanks to @morty_uk I found an almost secret staircase that led to the poster session. I think this was new this year and it was most welcome. After lunch I went to @flubdevork‘s talk of packaging with Conda. Anaconda is pretty popular in scientific circles and uses Conda. So I think this is something that I’m going to be seeing more of. I also, between the two lightning talk sessions, managed to see Tim Golden talk, very rapidly, on his experiences using pgzero and Raspberry Pi to teach a small group of young teenagers. Ah the lightning talks. At my first conference I had no idea what lightning talks were, now I see them as one of the best parts of the conference. People stand on stage in front of the big hall and talk for 5 minutes. Lightning Talk Man comperes and provides witty German jokes. I think we collectively must be getting better at lightning talks, because they were mostly pretty slick. It was especially exciting to see the kids do their own lightning talks earlier in the afternoon. Children just seem to have an infectious enthusiasm when they get into something, and it is really encouraging to see them getting coding. In between all this, I did manage to chat to a few people and share in the communion of tea and cake. 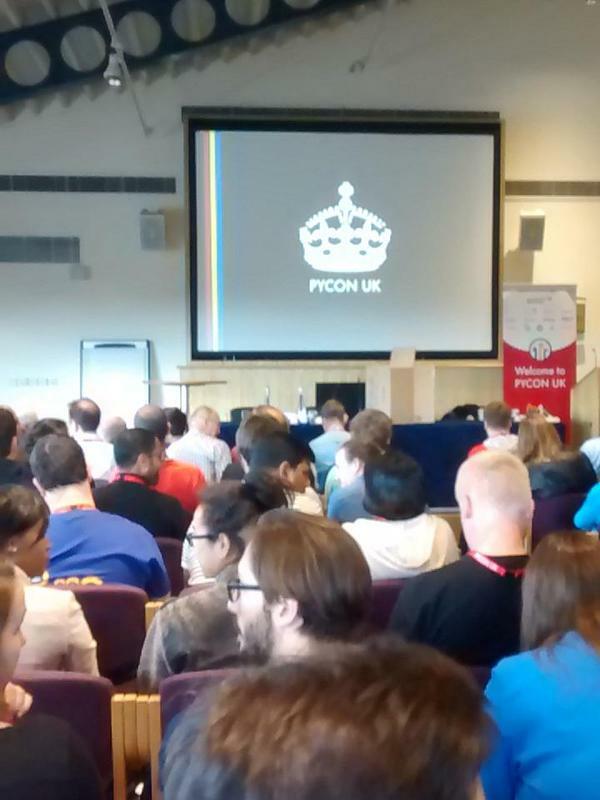 PyCon UK 2015 is the UK’s Python conference. Held again in Coventry. I didn’t go last year, in fact I have missed a few years and this has been my first PyCon for a while. What we really need to do is set up a UK Python conference. For me the conference is about the community: the people attending, the committee, the “do”-ocracy spirit. Conferences can be stressful on a personal level what with new places, hundreds of people you don’t know, strange food. It didn’t take me long before I was relaxing a bit and chatting to new friends. I think the Python community is very welcoming, I know I’m not the only one who thinks that, and I hope everyone attending is able to share that spirit. It was pleasing to see old friends (all a bit older! ), and very pleasing to make new ones, particularly the Python Ireland people enthusing about the upcoming PyCon Ireland. Yet again there was not enough time to meet all the interesting people that I wanted to, but I think that will always be true. One of the more endearing memories for me was when the daughter of Zeth, in a moment of inspired parenting, manged to get the microphone in the plenary session and was merrily shouting “MAC ADAPTER! MAC ADAPTER!”, clearly pleased to the moon and back to get the attention of 400 or so PyCon UK attendees :). Thanks to the committee and the volunteers, past and future!